If you’ve moved past the days where you want a desktop fish tank for your living room, office or dorm, or maybe you’re completely new to the world of fish as pets but know you want to start big. Either way, a 50 gall aquarium is an excellent way to balance a want for several fish and a moderately sized tank that isn’t going to take up too much space in the living area. 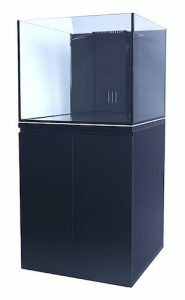 In comparison to many smaller, starter fish tanks out there, 50 gallon fish tanks are going to seem pretty big but it’s a fairly average size of tank as far as the market of fish tanks goes. 50 gallon fish tanks fit nicely in a common living space or a bedroom, even an office can hold a 50 gallon aquarium but the point of a fish tank this size is that it’s as much an aesthetic piece for your décor as well as a home for your community of fish. It’s going to become part of the larger décor and not just a small aquarium kept to the side. Of course, deciding the size and gallon capacity of your tank is only half the battle. There’s a lot that goes into selecting a fish tank. 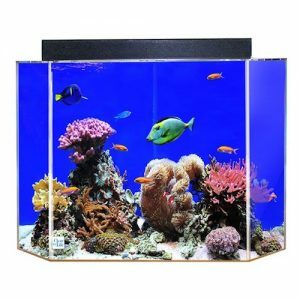 Some tanks are full on kits that come with accessories needed to make life livable for your pets. Some are simply the tanks themselves, designed for a veteran who already has most of what is needed. 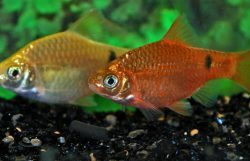 There are plenty of options depending on your level of competency and your needs as a fish owner. But you’ll need to be careful to check all the specs on tanks, all the properties of the filters, and the best fish that can thrive in such an environment. Also keep in mind location as a full 50 gallon aquarium will weigh a lot and will need a sturdy location with an electrical source and nearby water source. This 50 gallon fish tank is certified safe for freshwater fish as well as saltwater fish and is constructed of a clear acrylic material that is clearer than glass, 17 times stronger, and only half the weight, allowing for easy mobility of the tank if needed. The tank prioritizes a view of the aquatic world inside, giving a full view and hiding the 50 gallon fish tank filter from sight. The 50 gallon fish tank dimensions measures 36 inches by 15 inches by 20 inches all around and weighs a very light 20 pounds. It includes a reflector and 24 inch light fixture. 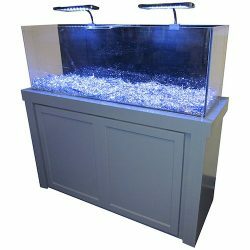 The acrylic make is very resistant to impact so if you’ve got kids who will be running around this tank, it’s a good choice to avoid the possible accidents that can occur. The biggest drawback is that, while it says combo set, it does not include any additional accessories to help you get started if you need them. And while the acrylic is a hard and sure way to protect the inside of the tank, the glue seam can be an issue you’ll want to keep an eye on. This 50 gallon tank features one of the more unique designs we have on this list. It’s, as the name suggests, a pentagon style but still manages to be a traditional table top fish tank at the end of the day. It’s got a full frontal view of the fish and a well-concealed filtration system thanks to a calming blue back wall of the tank. It’s suitable for both freshwater or saltwater fish. The measurements on this 50 gallon fish tank are 24 inches by 24 inches by 24 inches thanks to the pentagon design and the acrylic make of the walls of the tank make it durable and incredibly clear. This makes it a great choice for kids or high traffic areas. There’s no real design flaws or major drawbacks on this one besides the lack of additional accessories. 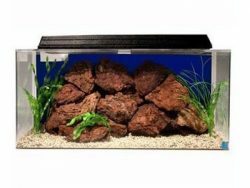 It’s a pretty well constructed tank and includes a lot of the essentials, though you’ll still be making some trips to the pet store after you buy it. 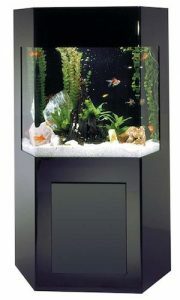 This 50 gallon fish tank claims to be the complete package and, while looking at it, it’s hard to disagree too much. It’s constructed with a heavy-duty cabinet for storage below and dual opening door. It also includes a SCA-301 skimmer and Atmen PH25000 return pump that both value at least $150. This 50 gallon fish tank with stand is a heavy one, but that shouldn’t be a surprise. It’s a whopping 250 pounds. It measures 24 inches by 24 inches by 20 inches while the cabinet portion measures 24 inches by 24 inches by 31 inches. There are also three holes drilled inside the tank for an overflow box. As far as filter components the Durso Stand Pipe, the return T pipe, the bulkheads, filter media, and bio media are all included. Despite the heaviness of this 50 gallon fish tank, there are no real deal breaking drawbacks to this choice. While it doesn’t include any accessories like a net or thermometer, it does include the necessary logistical components of a filter to get the job done. 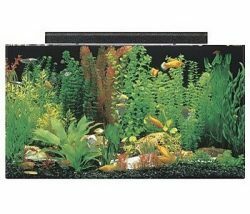 Read through our filter buyers guide to find the best one to accompany this 50 gallon fish tank for sale. This is more of your traditional looking 50 gallon fish tank. The rectangular shape and view from the front make it a good tank for anyone looking for the traditional, no frills kind of fish tank to set up in a bedroom, living room or office. It is also constructed with strong and clear acrylic nearly 20 times stronger than glass so it’s a very good option for a child as well. This 50 gallon aquarium dimensions measure 36 inches by 15 inches by 16 inches and weighs a very moderate 20 pounds, making it easy to move around if you need to. The filtration system is wet/dry biological and the chambers accommodate mechanical and chemical filter media as well. Space for a heater is there, though the heater itself is not included. If you need a heater, you can review out best heater buyers guide. The 50 gallon fish tank hood includes a 24 inch fluorescent light fixture, though the bulb itself is not included. There’s no functional issues with this aquarium but it does have a lot of things not included. There’s space for a heater but not heater itself, and the same goes for the light bulb. So some items that normally might come with a fish tank you’ll need to get separately. But other than that this is a great tank for a younger fish owner. Just looking at this 50 gallon aquarium for a second sets it apart from the others on this list. If you want something flashy to include in your décor, then this is the tank for you. It’s got a traditional rectangular design but with a modernized flourish that gives it an incredibly look while giving the fish as much space as possible to swim freely. It comes in either a grey finish or a black finish, so you can choose which color best matched your style and décor. The aquarium measures 51 inches by 18 inches by 47 inches and, despite the size, weighs only 144 pounds, making it only the second heaviest tank on this list so far. It’s made from durable and extra clear acrylic and the cabinet below is constructed from hardwood. It includes an all-in-one filtration system and 2 well placed and stylish LED lights. Drawbacks? Well even if it’s not the heaviest, it’s still pretty heavy so it probably wouldn’t be a good idea for anyone who needs a somewhat mobile tank. The filtration system is there but no other accessories to speak of and there’s no hood included in the design. It seems we’re saving the most uniquely designed tanks for last when it comes to these lists and this one is not breaking that trend. This 50 gallon aquarium is another freestanding one (that has the stand included—important) with a three sided view of the fish in a hybrid cylinder, pentagon design. It’s a sleek black, constructed from acrylic for maximum impact resistance, making it great for kids and high traffic areas. This tank measures 71 inches by 45 inches by 21 inches all around and is a very workable 60 pounds, despite the apparent size of it. It includes a high-powered, three-stage canister filtration system, aerator, plants, and gravel, as well as a pump, are all also included in 50 gallon fish tank starter kit. And the tank can hold a community of freshwater or saltwater fish. There’s no huge drawbacks here beside the lack of accessories. The stand is included and assembled before delivery and a lot of the logistical components and aesthetic pieces of the tank are included as well. You’ll still want to run out for some items but for the most part this tank has everything you need. Here you’ve got seven options for both moderately priced and cheap 50 gallon fish tanks. There’s a range here of traditional designs to more décor friendly, modern designs. Most of them don’t include accessories so keep that in mind, as well as your level of expertise in caring for fish, before sealing the deal on any of these purchases. 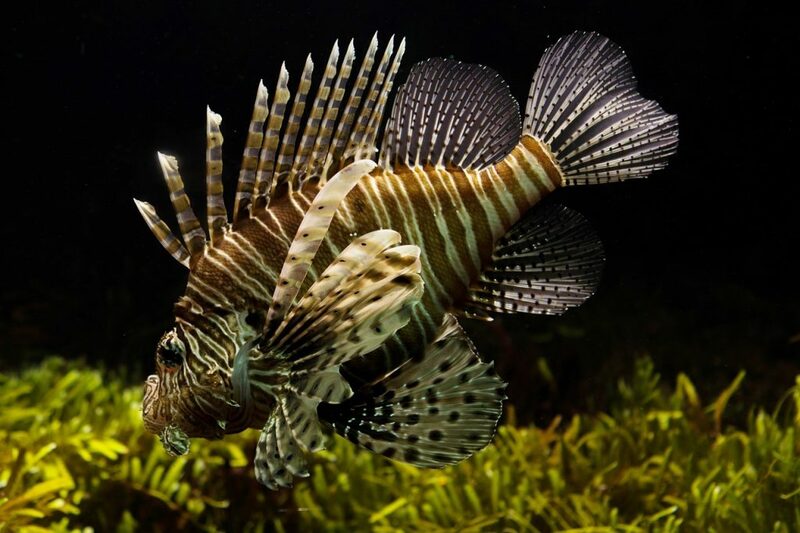 The good thing is they have very few design flaws between all of them which makes them all great choices, depending on your needs in 50 gallon aquariums. 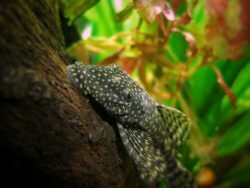 Take time to evaluate the list of large fish tanks for sale as well as your specific needs and where you plan to keep your fish tank 50 gallon in size. Always test things out before introducing fish to this environment and remember to have fun with your pet keeping! We love the 50 gallon aquarium size, it’s great for both the home or office and will fit many small and some medium sized fish. Let us know your thoughts or questions in the comments section below, and thanks for reading.